1) Can you introduce Arkane, what is the story of the project? ArkanumX (Me) started his official musical career as a co-founder of ancient folk project Daemonia Nymphe and released two albums with them, "Bacchic Dance of the Nymphs" and "Tyrvasia" back in 1996. After his departure from Daemonia Nymphe in 1999, ArkanumX (as IkonX back then) formed xARKANEx in the year 2000 and released the debut album Arcane Elitism in 2002 through the American ethereal label The Fossil Dungeon. In the year 2005 ArkanumX makes a new beginning changing the name from xARKANEx to ARKANE and after three years of recording in the process, the debut ARKANE album gets to see the light of day, entitled Enraptured Serene Mesmerism (released in 21 January 2008 on Seduction Productions. 2) You were in Daemonia Nymphe, why have you left the band? The other co-founder and basic person behind Daemonia Nymphe moved away from Athens and we kinda lost contact in terms of musical side of things - Then he hired his wife as a member and my departure became a fact in 1999. Spyros is my brother anyway so Daemonia nymphe has always remained a family thing. 3) How would you introduce this new project to someone who likes your works with Daemonia Nymphe? 4) Is this new project connected with Greek mythology? There are certainly some references to the ancient Hellenic past but mainly to the mystical ritual side of seduction. 5) Arkane is not a very original name for dark music and Arckanum is also the name of a famous black metal band... but the arcane concept seems to be important for you, can you talk about it? 6) What do you want to express with themes like sirens, mesmerizing and seduction? Love? Sensuality? Poetry? It reminds me Black Tape for a Blue Girl, but I guess you talk about the sirens of the mythology?!? I am obviously heavily fascinated by the term Seduction and what secretly lies behind it. Yes, the Sirens in the Hellenic Mythology played the role of the dangerous seductresses that allured Odysseus and his mortal companions with their mesmerizing song - In that similar way ARKANE desires to mesmerize its listeners to an ecstatic Trance short to speak... That is the main Purpose of my music. 7) Why are there some "X" in your names? ArkanumX is the nickname I use in ARKANE... 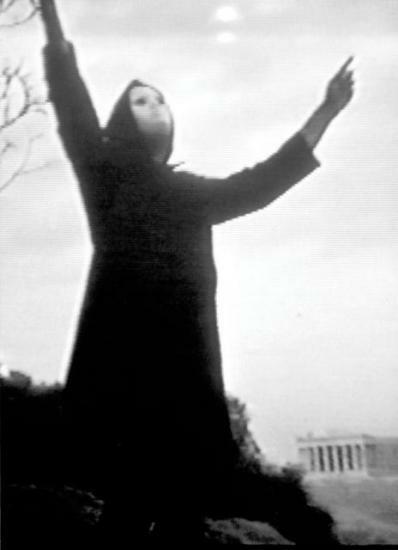 I am that faceless Masked Persona all dressed in black in a similar way as I would Act in front of an audience in a theatrical play. ArkanumX pseudonym refers to the enigmatic mystical obscene mystery of who would be hidden behind this mask. 8) There were not female vocals on your first cd, and they add something great in your music, but the singer is not in the band. So do you want Arkane stay a "one man band"? Definitely ARKANE was, is and forever shall be a one man project. This is the best way to Express My Artistic esoterical concerns and that can only be achieved individually. Of course I might be having the support and Aid of certain special individuals, without them maybe ARKANE could never have existed - although it might sound Egoistical, ArkanumX shall ever and ever remain the Mastermind behind this Project. 9) As you are interested in mythology, what do you think about the dark folk scene which deals with the European past? Of course I am interested in mythos and cults of Ancient Lands. Dark Folk scene is quite interesting with bands like DEATH IN JUNE, CURRENT 93, BLOOD AXIS, SOL INVICTUS, FIRE AND ICE among others although I am a great dedicated follower of The Dark Neoclassical Movement. I strongly believe that the greatest projects in that rare underground style of music are : DEAD CAN DANCE, IN THE NURSERY, ELIJHAS MANTLE, ARCANA, THE PROTAGONIST, WILL , ELEND, GOTHICA, TRIARII, CHAOSTAR, ARKANE. Make a favor to yourself and search for those projects on Myspace and other resources..You won't regret it!!! 10) "Arcane elitism" is the title of your first album. What is the elitism for you? 11) Is the track "Summoning the muse" on your first album a reference to Dead Can Dance's "Summoning of the muse"? 12) Some tracks on your previous album were more orchestral like the track "Arcanum". It's remind me bands like Sophia (from Cold meat industry), is it a possible way to explore in the future? xARKANEx is a thing of a past and it shall forever stay there... ARKANE is the new era... The new chapter... 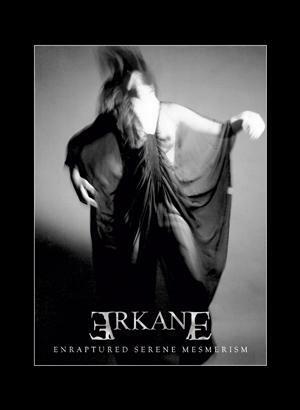 The new seduction of "Arkane" stigmatized by a professional and sophisticated concept dominated by inspiration and perfectionism, as presented in the debut album "Enraptured Serene Mesmerism". Focusing exclusively on the dark symphonic neo-classical idiom characterized by an intense soundtrack'ish atmosphere that emphasizes on the entrancing, mesmerizing aesthetics of seduction. ARKANE musical and aesthetic concept has elevated now into more sophisticated and specific forms of art. 13) Daemonia Nymphe is in connection with ancient Greek music, but what is your musical background? I started playing music when I was 16... My musical background was purely Black metal... I still listen to the old cult Masterpieces from bands such as CELTIC FROST, BATHORY, MAYHEM, DARK THRONE, MASTERS HAMMER, LIMBONIC ART etc etc etc... I followed the death Metal/Black metal Idiom from the very beginning to its end... Amazing Old Glory Days...! 14) What is music for you ? I guess it's not just a hobby ? 15) You have proposed for free your album, with only payment for postage, why not a free download? What do you think about downloading? Do you see as a way to promote music? The Album has also been released digitally through the American Net label FOSSILDUNGEON (www.fossildungeon.com) and exposed to various downloading websites such as iTunes, eMusic, Amazon, Rhapsody, Napster, Yahoo Music and AOL Music, which obviously takes the music of ARKANE to a wider Audience . 16) Will Arkane play some concerts? And what form would it take: music with videos like Cold Meat Industry bands or theatric performance like Daemonia Nymphe? 17) What do you think about the old dark metal scene in Greece, are you in connection with: Rotting Christ, Septic Flesh, Nightfall, Necromantia, Varathron, and Astarte? Are you in contact with Greek bands like Slow Motion, Decadence or other bands from the experimental CAPP label (Glaufx Garland)? 18) What can you say about the situation of your country today? Can the glorious mythological past of your country give some answers to people today? The situation is really bad here... Everyone is unhappy and disappointed as well as angry against all those corrupt politicians who stole so much money and lead Greece to bankrupts... Let's hope that something positive might come out of this bad situation and the people gets awaken! Thank you so much for this interesting interview.